Come Together. The Beatle’s iconic album Abbey Road played in its entirety. The Triffid, Friday, August 4 And The Sound Lounge Sunday, August 6. The Honey Sliders will be recreating The Beatles’ landmark classic album Abbey Road live on stage in its entirety with special guests to be announced. The Honey Sliders are some of Australia’s best musicians and they have a history of creating respectful and outstanding recreations of their favourite albums. This promises to be a very special night. 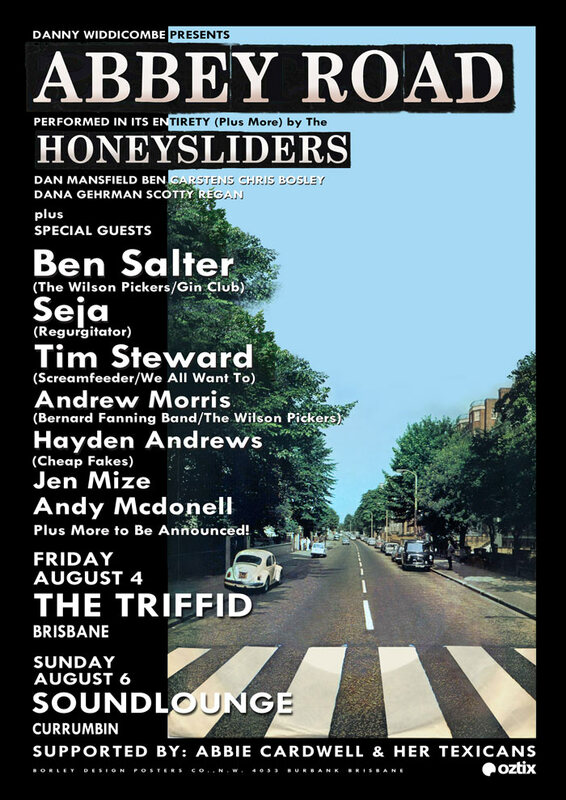 The Honey Sliders, presented by Danny Widdicombe, plus special guests perform Abbey Road at The Triffid in Brisbane on Friday, August 4 and at The Sound Lounge in Currumbin on Sunday, August 6. The Honey Sliders have built a reputation for their stunning recreations of some of their all-time favourite albums. Starting with Hendrix’s Axis: Bold as Love in 2013, they went on to wow the audience with a live, rambunctious rendition of Neil Young’s On the Beach the following year. In 2015 they went on to break box office records with the sold out extravaganza of The Band’s classic farewell concert The Last Waltz. The Honey Sliders’ reputation for staging respectful recreations of classic albums was cemented with their performance of The Last Waltz which special guests like Bernard Fanning, Troy Cassar-Daley, Jeff Lang and Ian Haug. 2016 saw the band play sell-out shows performing The Rolling Stones’ cult album Sticky Fingers with Australian rock legend Tim Rogers on lead vocals. Abbey Road was the last recording the Beatles made and it has become their most enduring album. It is famed for being one of the most influential and revered albums of all time. The album cover is universally acknowledged and imitated daily on the very same crossing on Abbey Road, adjacent to the famous studios where The Beatles recorded the lion’s share of their extensive catalogue. Starting with the swamp blues intrigue of John Lennon’s Come Together and ending with Paul’s epitaph of wisdom The End, Abbey Road is a powerful mix of beautiful songs (Something), heartfelt soul balladry (Oh Darling), pop wizardry (Octopus’s Garden) and deep hypnotic blues (I Want You / She’s So Heavy). The Honey Sliders are led by Danny Widdicombe who is a member of the Three x ARIA Award nominated band The Wilson Pickers and has played lead guitar for the likes of Bernard Fanning, Tim Rogers and many more. Danny is renowned for his formidable guitar playing and songwriting. On keys, bass, guitar and almost anything else he turns his hands to, Dan Mansfield is the musician’s musician and has played all over Australia as a part of the cult band The Gin Club and with Australia’s premiere rock n roll band You Am I. Chris Bosley has toured the world as bass player in the groove collective known as The Resin Dogs. Ben Carstens keeps time for the band and is also a member of local Brisbane rock band Mexico City. Supporting The Honey Sliders and their Very Special Guests will be the wonderful Abbie Cardwell and her band the Texicans. Abbie Cardwell has toured the world with her music and is known for her brilliant live performances and well-crafted songs. Abbie will be performing some classic Mexican inspired Beatles covers. The Honey Sliders with Danny Widdicombe and Special Guests Present The Beatles’ Abbey Road. 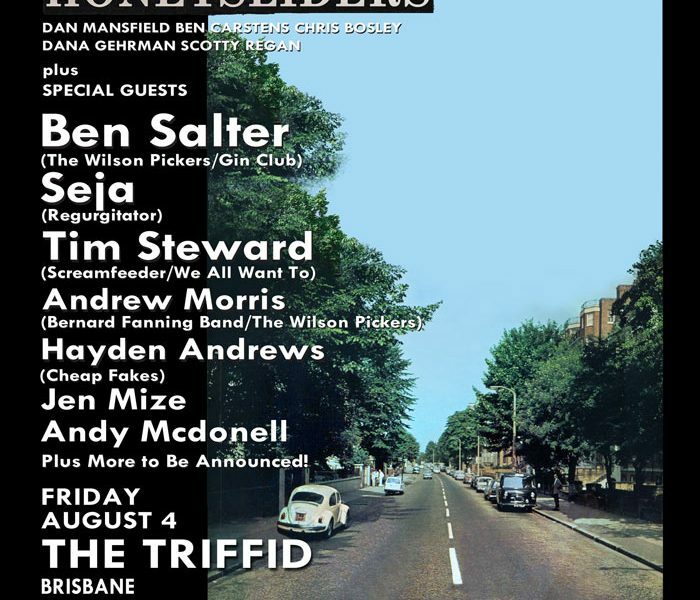 Triffid, Brisbane Friday, August 4, The Soundlounge in Currumbin Sunday, August 6. Tix are $30+ Booking fee.